Description Emanuel Leutze was born in the town of Schwäbisch Gmünd in the state of Württemberg in southern Germany. His family immigrated to the United States while he was a child, living first in Philadelphia, Pennsylvania, before settling in Fredericksburg, Virginia. In 1840, sales of his early work enabled Leutze to study at Düsseldorf and then Munich. Leutze returned to America in 1851 on the occasion of the exhibition of what was to be his most popular work, Washington Crossing the Delaware (Metropolitan Museum of Art, New York). 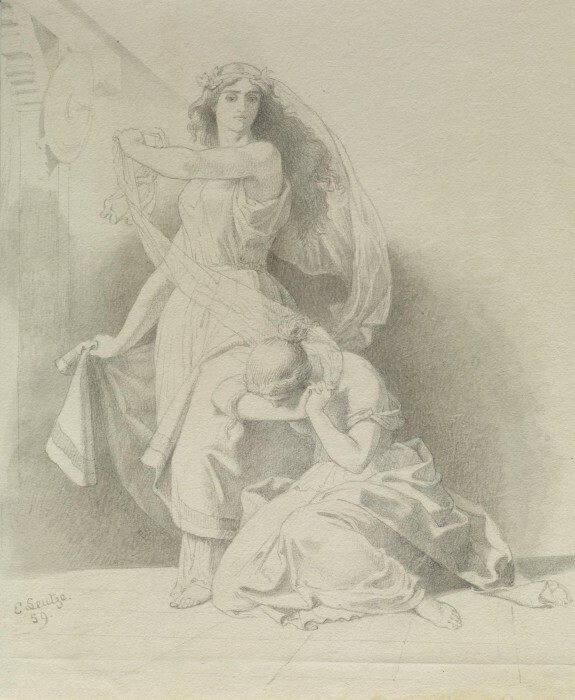 It is not known if this drawing of two women in classical dress relates to a specific painting by Leutze, but he used the pose, which derives from antique statuary, in several other compositions. German Drawings from the Walters Collection. The Walters Art Museum, Baltimore. 2010-2011. American Artists Abroad: Works from the Permanent Collection . The Walters Art Museum, Baltimore. 2014. Provenance William T. Walters, Baltimore [date and mode of acquisition unknown]; Henry Walters, Baltimore, 1894, by inheritance; Walters Art Museum, 1931, by bequest. Connect with Facebook to start your own collections!